A cute combination of an English Springer Spaniel and a Labrador Retriever, the Springador is also known as the Labradinger. These large dogs, thanks to their parent breeds, are prone to both major and minor health issues. However, you can do your part to prevent many of their inherited health problems with routine vet visits, regular exercise, and a nutritious diet plan. Plus, most of the following health issues are subject to early detection, so you can sometimes avoid infection or outbreak altogether. Recurring ear infections are usually caused by an underlying illness, such as skin allergies. When the allergies are severe enough, they result in recurring infections due to bacterial growth in the inner ear canal. Some strains of this bacteria are strong and adaptable to antibiotics. Usually, to combat recurring ear infections, you have to be diligent about cleaning out your Springador’s ears and applying antibiotic drops to banish the infection. It might take several rounds of antibiotics to get the infection to completely go away. Bloat is a condition that occurs when gas and fluids become simultaneously, painfully trapped inside the stomach. Also known as twisted tummy, this condition is recognized by the following symptoms: swollen, distended abdomen, lethargy, grumpiness, frequent urination, dramatic dehydration, and insatiable thirst. Bloat, in the worst cases, can be deadly. 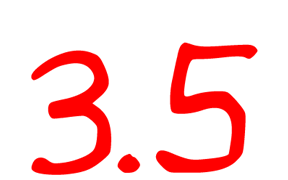 Vets use a combination of prescription medications, IVF, and possible surgeries to correct the problem. Other health problems that may one day plague your Springador include cold tail, joint dysplasia, acute moist dermatitis, cherry eyes, heart disease, and epilepsy. 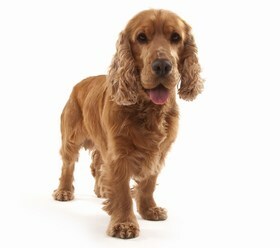 Despite their list of possible health issues, these crossbreed canines have a lifespan of 10 to 14 years. Because of their intelligence and keen alertness, the Springador has been trained as military and officer companions for the last decade. Their smarts and wits come in handy when tracking down and chasing small prey, but they also have the loyalty and patience to be therapeutic to disabled people. 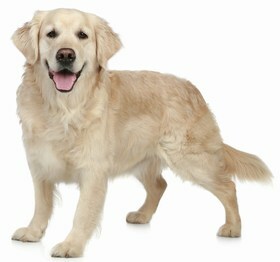 Their sweet nature and even, calm temper makes them an ideal family dog, especially families with children of all ages. When it comes to a dog being great with kids, most of that has to do with how children treat the dog. Your Springador, while patient and kind, has a limit, like any dog. Sometimes a child might get on her nerves by doing something hurtful or annoying, i.e. hair, tail, or ear pulling, pinching, or rough-housing. Teach any kids that may be around the pup how to properly, respectfully play and pet your Springador before you lay trust in the two being alone together. Socialization is important for all dogs, but the Springador enjoys socializing from a young age. These crossbreed dogs are excellent with other pets, especially ones they’ve grown up with. She loves a busybody lifestyle because of her high-energy disposition, so keep her mind and body occupied with plenty of mental and physical challenges and tasks. She is energetic and playful, so exercise is important. Take her on regular walks, or allow her to romp around in a dog park or a fenced-in backyard. A Springador is one of the easiest crossbreed dogs to train. She is clever, keen, and intelligent with an eagerness to please her loved ones. She knows that you are the alpha and the dominant one in her pack. This makes her responsive to your commands and attentive to your instructions. She excels at challenges, which is what training presents to her. She will pick up on your commands quickly, so be ready with treats and praise to reward her for following your instructions. Some dog owners use force and harshness to train their dogs. If you are one of these types of people, the Springador is not for you. These pups can be sensitive; therefore, they don’t respond well to fierce punishments or negativity. Use kindness, patience, and a positive tone to communicate with your Springador. 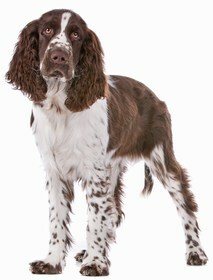 Where the Labrador Retriever is known for its sleek, shiny, close-cropped fur, the English Springer Spaniel’s coat has lengthy, density, and waves. Your Springador will likely take after the English Springer Spaniel because, coat-wise, those will be the dominant genetics. Use a thick-bristle brush to groom your Springador on a daily basis. She sheds quite a bit in warm weather, so be ready with a vacuum. You can also keep her coat looking and feeling healthier with a once-a-month bath with a gentle dog shampoo and conditioner lather. Dry her completely afterwards, then brush the entire length of her hair from head to tail. She’ll look absolutely gorgeous, no doubt. Your Springador has a healthy appetite and she requires good foods to fuel her energy. Feed her twice a day with 2 cups of dry kibble each time. 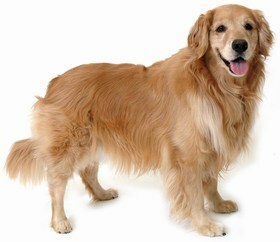 The dog food should be nutritious and wholesome, using lean meats and whole grains as the main ingredients. Most cheap dog foods are filled with by-products to stretch the longevity of the food. This could harm your Springador’s health over time, so opt for a heartier kibble. The cost might be a little steeper, but her health matters more than the cost of dog food and will pay off in the long run. Springador breeders are abundant, especially in warmer climates, like North Carolina, South Carolina, and Florida. They love swimming, so you can expect to track down a Springador breeder near natural lakes and rivers. The average Springador breeder will charge you at least $200 for a puppy, but you might wind up paying up to $900. This is at the discretion of the breeder, as some have extra inclusions, like vet check-ups, first vaccinations, and deworming. You can also check your local shelter for a Springador. These dogs aren’t rare, so you might get lucky in finding one who needs a new, loving home. Adoption fees range from $125 to $200. Ranking takes into account a few basic factors including cost, skill level needed, high vs low maintenance and how critical regular training is to success. The Springador is a 1 on the integration scale because you really could not ask for a better crossbreed companion. She is sweet and loving with a protective, loyal nature. She makes a great family pet, and she would be a good protector of children.